Spread betting at CityIndex is another spread betting provider that has been around for a long time now. While the not the largest spread betting broker, CityIndex still has a significant heritage, having been established as a spread betting provider in 1983. The City Index group has offices in the United Kingdom, USA, Poland, Singapore, China and Australia and as a whole transacts one and a half million trades every month around the world, including contracts for difference and Forex for individual traders in over 50 countries worldwide. Based in Finsbury Circus in London, City Index is one of the oldest spread betting firms around. It was established in 1983, offers Spread Betting and Contracts for Difference (CFD) trading and serves clients all around the world. 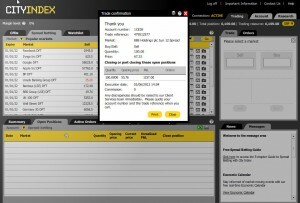 Access over 12,000 markets including global stocks, indices, ETFs, forex pairs, commodities, treasuries and options. Competitive tight spreads from 1 point. Trades from just 50p per point, going long or short. 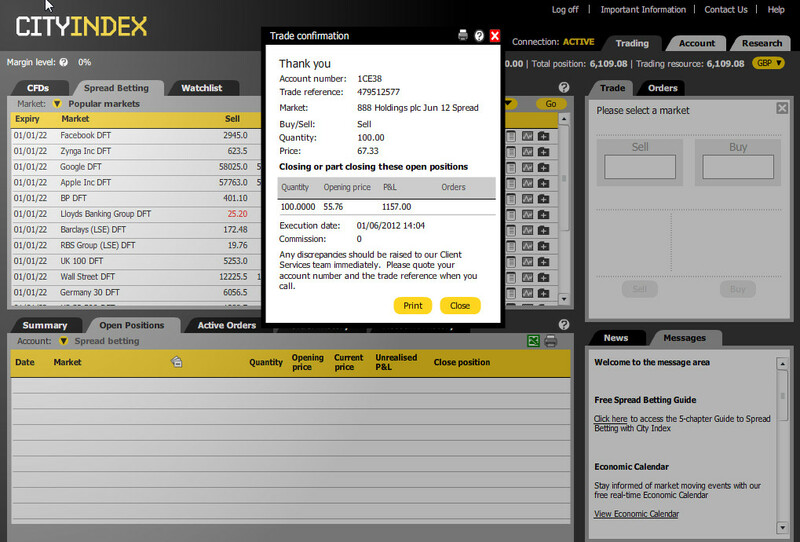 Spread betting and CFD trading from one platform. 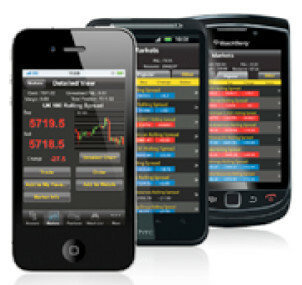 Superior Mobile trading platform and charting package. 24-hour dealing and unlimited market resources and tools. In common with most spread betting providers, CityIndex a wide range of indices to spread bet upon, with only a one point spread during market hours on all five majors, the FTSE 100, the Dow, the DAX 30, French 40 and the Australia 200. It also covers thousands of shares from world markets, and has a special feature of lower margins and lower spreads for day trade betting, making it worth a look if you are a daytrader. The range of underlying currency pairs for spread betting on the Forex market includes many exotics as well as the standard pairs. The commodities include a wide range of metals and access to the US and UK markets for agricultural products. Of course spread betting is still counted in pounds sterling per point, even when you’re betting on foreign markets. Other financial markets on which you can spread bet include the range of bond markets, such as the UK gilts and the US treasury notes; the future movement of interest rates; market sectors, taking a broad view of entire sectors; and options on indices, currencies, and commodities. 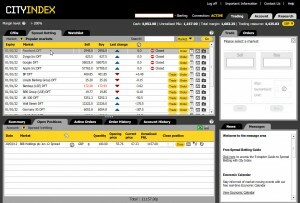 The computer-based trading platform which CityIndex offers is browser-based, with a clear and easy to use interface. The platform includes full CFD functionality, allowing you to trade both spread bets and CFDs without loading different platforms. You can also trade from your Blackberry or from your iPhone. CityIndex offers a four-week ‘Learn to Trade’ trading course in spread betting and CFD trading. A special feature is that it allows smaller spread betting trade sizes of as little as 25p a point (usually from 50p per point) and gives reduced commissions on CFDs for the first four weeks of your trading, so you may build up your confidence. It runs weekly seminars in London covering different topics of trading, such as using candlestick patterns, and explaining basic technical analysis. Looking at the list of order types, you will see it has a good selection of orders, including One Cancels the Other which is useful for placing simultaneous opening orders. The trailing stop loss order is missing, but you can use a guaranteed stop loss order at an additional cost. In any case City Index now automatically close you out if your margin is reached so it’s less likely to end up in debt. Daily rolling trades can be rolled overnight from day to day with no profits or losses being crystalised, although then a financing fee for this will be incurred at 2.5% +/- Libor (currently 0.5%) of the notional value of the trade. A nice feature is that the CityIndex offers a demo account for you to try out their trading interface and your spread betting strategies and decide whether you wish to continue with it. The demo account is available for two weeks and starts with a “virtual” balance of £2500. If spread betting at CityIndex is something that appeals to you, then the best way to decide on the broker you wish to use is to open a demo account and make sure you use it during the available period. The company has also recently launched a new trading platform dubbed as ‘Advantage Trader’ which permits clients to use tools like auto trading technology consisting of a number of in-built trading strategies and technical indicators. 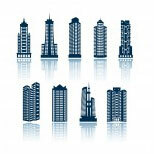 Tradable markets: Wide range of markets includes top US, UK, European, Asia and international stocks and indices. Currencies, Commodities, Sectors and Bonds and Interest rates. Options also available. Limited risk spread betting account available? : Limited risk spread betting account not currently available. Enhanced price transparency with firm quotes up to ‘Their Size’ – offering price and execution certainty for any trade up to this size. Access to real-time financial news and analysis feeds from Dow Jones Newswires – so you can keep up-to-date with the latest market movements. Fixed spreads in all CityIndex markets – only in very exceptional conditions will CityIndex change their spreads. Responsible margin rates – competitive margin rates set at responsible levels to reflect market conditions and help clients manage their exposure. Usual functionality like stop loss orders to help mitigate losses automatically at predetermined levels and limit orders to lock gains. Place and monitor existing trades at anytime – 24-hours a day. Guaranteed stop orders available on a wider range of markets – with the ability to set your guaranteed stop when you open your position, or at a later date for maximum flexibility. Free daily market commentary newsletter in addition to access to a professional and interactive charting package as well as a suite of trading tools and technical analysis indicators. For a period of four weeks starting from the day you first fund your City Index account, you are able to bet lower stake sizes from just 25 pence per point. At the end of the four weeks period your trade sizes will move to standard City Index sizes, starting from 50 pence per point. Any new positions that you open from this point will be subject to standard minimum sizes. Free weekly spread betting seminars covering the basics of spread betting are available as well as more advanced classes covering technical analysis, candlestick patterns and trading strategies. For a 2 week period City Index offers a Demo account which lets you ‘trade’ on live price movements with a virtual cash balance of £2,500 for two weeks at no risk. Trade on over 15,000 markets ranging from global equities, indices, forex, commodities, bonds, options, etc. Mobile Trading: Yes! Clients with live account benefit from a dedicated account manager and can access City Index’s mobile and iPhone trading applications. City Index has been voted ‘Best Mobile Trading Platform 2010’ at the MoneyAM Online Finance Awards and now offers dedicated apps for the iPhone, iPad, Android, Blackberry, Java and Windows Mobiles. These allow spread bettors 24-hour access to live prices on thousands of markets worldwide. 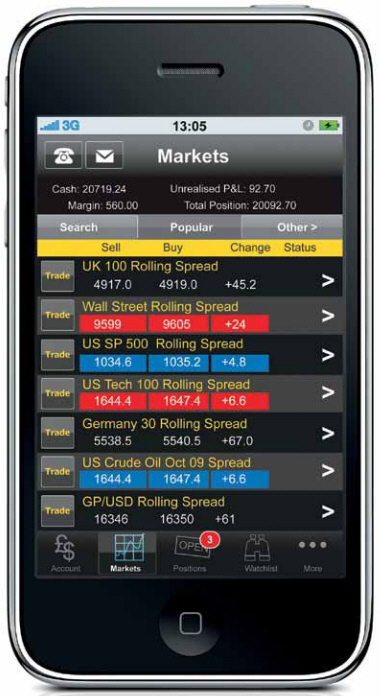 You can use City Index’s iphone application to check the latest prices or place new trades and close positions. You can also use it to amend existing orders or add stops or limits including if done and OCO (one cancels other) in the same way that you can with the desktop version. 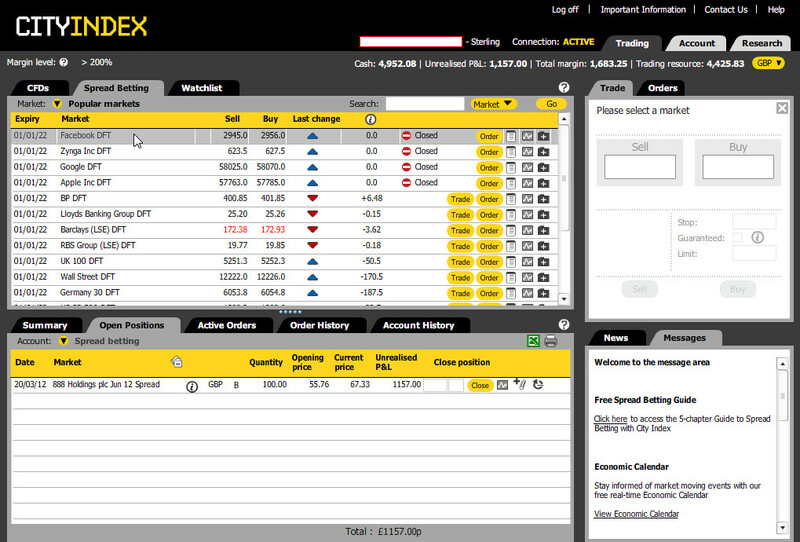 Or you can check and amend multiple watchlists while monitoring your positions using CityIndex’s positions chart. Recently the iPhone application has been upgraded so now it features live streaming charts with technical indicators and latest prices as well as a Dow Jones Newswire to keep traders abreast on the latest market movements. Not only do these charts display 24-hour live prices on a multitude of global financial markets, the new charts also automatically update in real time without the need to refresh the screen (cool!). Mobile Trading: Yes! We can say that City Index was the pioneer of mobile trading in the spread betting industry having been the first provider to create an innovative iPhone spread betting app in October 2009. Since then the company has went on to release app across BlackBerry, Android, Java and Windows earlier this year. All applications provide complete account access with a live Dow Jones news feed and the latest live prices as well as a full range of different order types which include the ability to create new or amend existing orders or set stops and advanced limit orders like if done and OCO (one cancels other). Additional functionality includes the functionality to view/amend multiple watchlists and the ability to review trade and order history. The charting package on the iPhone application is particularly impressive with live auto refreshing prices and numerous technical indicators which traders can apply to help them analyse the markets. It is thought that around 20% of all trades at City Index are now conducted via a mobile with 35% of all clients using their mobile to trade. Downsides: Somewhat clunky platform. Also, I like the 1pt spread on the Dow Jones 30 rolling index but disappointingly City Index still doesn’t provide full details of its spreads online (only covering some basic information on the most popular markets) and you have to create an account to check these details. This is a negative for me as it suggests that City Index’s spreads on other markets may not be so tight. There also appears to me to be a tinge of arrogance in their business dealings with both clients and partners alike which pushes me to avoid this outfit. Lastly, I’ve heard reports of traders being put on dealer referral at City Index – you enter trades but when trying to close them out you can be delayed for a minute or so (the dreaded ‘Please wait for a quote’ message whenever you try to close my position). If this happens to you I would ask them outright if you’re on dealer referral. I’m not referring to asking the front girl who answers the phone and replies with some jumbo scripted responses, you will need to speak to one of the traders on the risk desk. They won’t lie to you and will tell you if they’ve made the conscious decision to route your trade requests through their manual processes rather than straight through like the vast majority of their trades because you’re very good that’s their prerogative, but you’d rather know for sure than assume you’re being treated poorly. In any case if you’re on dealer referral, you really need to switch providers because this puts the odds seriously against you. Anything for newbies? : City Index offers a four-week ‘Learn To Trade’ Programme allowing new clients to start betting with lower stakes (starting at 15p a point) while they familiarise themselves with the platform and trading service. The four-week programme is complemented by a series of educational emails to help educate new traders about spread betting.